David H. Paul, Inc. is a high-tech water treatment training and consulting firm that was founded in 1988. DHP has always been 100% committed to providing practical, cost-effective, unbiased high-tech water treatment training and technical services. All DHP training opportunities have a limited number of seats to ensure an optimal learning environment and significant opportunity for hands-on learning. 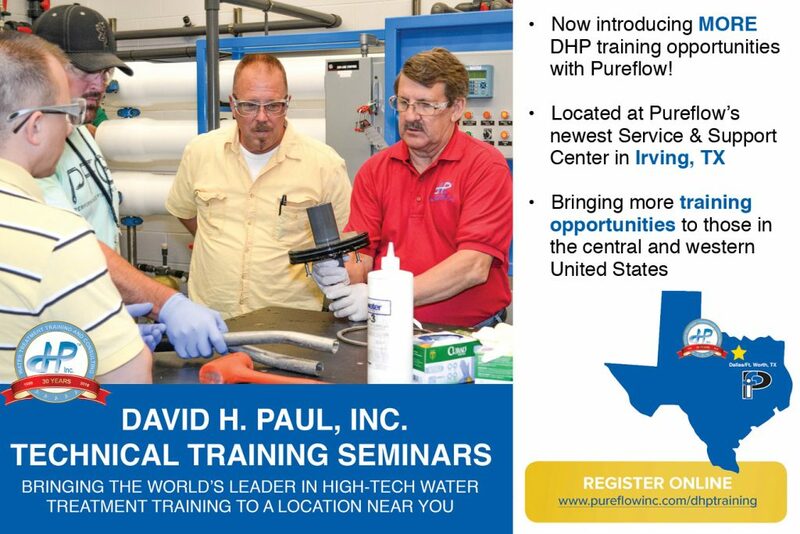 For over 10 years, Pureflow has partnered with David H. Paul, Inc. hosting high purity water treatment training at our Corporate Headquarters in Graham, NC. David Paul has also been a featured speaker at our many technical training symposiums. We are excited to be adding an additional location for these high purity water treatment trainings at our Service & Support Center in Irving, TX. This will allow us to better serve those in the central and western United States with their training needs. Below you will find all of our upcoming DHP training events at both our Graham and Texas location. Dependable service is not only our trademark – it is our foundation, our cornerstone and your peace of mind. To ensure our customers have continuous service, we provide 24/7 service and emergency on-call support to handle the unexpected. ©2015 Pureflow Inc. All rights reserved.